Hello everybody, sorry for my bad english. My question is about business administration and customization of promotion request process. I need to create promotion request for approve process by six or more teams at one time. The problem is to create parallel process and routing in template. This process first of all creates task to a leader who choose a team members, at the second time it creates tasks to a choosen team members. This process first of all creates task to a leader who choose a route      , at the second time it creates tasks [Task_1] [Task _2] [Task_N]. Approvers can choose approve, reject or rework. If approver from Task_1 choosed "rework" option - author will recieve "Rework task", all other tasks will be not end. After finishing "Rework task" only approver from Task_1 will recieve new task, other approvers will be able to see new iteration of promotiong objects in the first iteration of their tasks. If approver from every task will decide that he is not able to promote objects (wrong routing or something else) he choose "reject" option and the leader will be recieve a new task and need to chose another route or decide to reject whole promotion. The problem is in "question mark point" (?) i don't know what type joint i need. If i choose "OR" type - the proces will be end if one approver check "approve"
I need to create some relation beetwin routing decigion on the first task and compare at join point. 3) Join type is "AND"
3) Join type is "OR"
promotion process will be finish and objects will be promote to the next lifecycle state. My experience is with Change Notice/Change Activity. After reading your description, I would recommend you look into that setup to see if it can be molded into your desired outcome. I say this because the Change Notice can have several tasks embedded within it (Change Activities) that go to different people. What you're describing is nearly identical to a new workflow I'm working on right now, where we'll have anywhere between 1 and 5 assignees, but all tasks need to be finished before the rest of the release takes place. This allows the person starting the workflow to create tasks , , , ,  and , or any combination of those. The creator could just not create tasks  and . Then, when the first four (Change Activity) tasks are completed, the Change Notice continues thanks to the 'Sync on CA Complete' robot. The speed-bump is that these tasks all use the same template, but if that's not a concern then it really sounds like CN/CA is more like what you're looking for. If you can't use the CN/CA workflows for whatever reason, I still think there are several ways you could make this work. 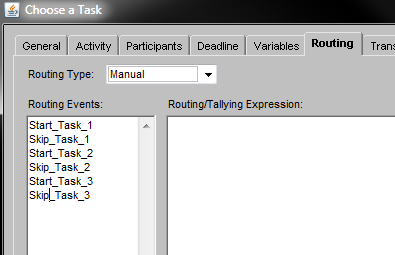 The first that comes to mind is the 'Choose a route' task having several routing elements, like 'start task 1', 'skip task 1', 'start task 2', etc. that the assignee can choose to start or cancel. This would allow the person doing that 'choose a route' to decide which tasks get started and which tasks get skipped. The 'skip task' route goes straight to the And node while the 'start task' routes go to the activity nodes. I haven't tested this, so it may not be a solution at all.